Holy Baptism is the beginning of the Christian life, the gateway to life in the Spirit, and the door which gives access to the other sacraments. They must schedule an appointment with the pastor to register for Baptism. They ought to be registered members of Holy Trinity Catholic Church. They must be attending Mass and participating in the sacramental life of the Church. For their first child, they need to register for and attend a Baptismal preparation class, as offered by the parish. For subsequent children, Baptism class is highly recommended but not required. Classes are generally held at 6pm on the second Sunday of the month, by appointment. The Baptism will be scheduled with the pastor to be celebrated after the 10:30am Sunday Mass (about 11:45am) generally on the first Sunday of the month. The following are guidelines for those requesting to be Baptismal sponsors (godparents). They must have received all the Catholic Sacraments of Initiation: Baptism, Confirmation and Eucharist. They must attend Mass regularly and receive the Sacraments of the Church regularly. They must be living the Church Teaching of marriage and chastity (if single, not cohabiting, if married, married according to the Law of the Catholic Church). If a Holy Trinity parishioner, the pastor must approve; if they are from another parish, a letter is needed from their pastor stating that they are a parishioner in good standing. Sponsors for Baptism should be persons who will support you in raising your child in the Catholic faith. Their lives should be an example of active faith and selfless service. 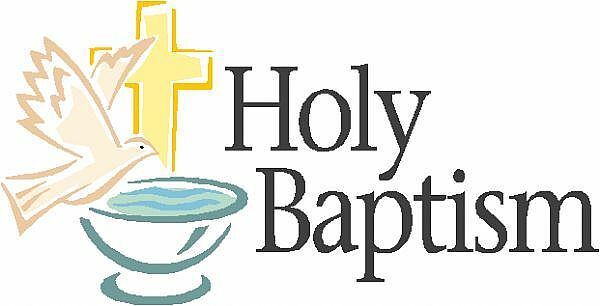 They are encouraged and welcomed to attend a Baptismal class. Ordinarily, there are two godparents for a child; however only one is necessary. If there is only one godparent, he or she must be a Catholic in good standing as above. If there are two godparents, they must be one man and one woman. At least one must be a Catholic in good standing as above. The second sponsor must be either a Catholic in good standing as above, or a non-Catholic baptized Christian who is in good standing according to his or her Christian denomination. Exceptional situations may be prudentially considered. Baptism is a vital sacrament for the salvation of a child, and compromised situations may not necessarily be impediments. According to Church Law, however, there must be a well-founded hope that the baptized child will be raised in the Catholic Faith.